Learn tips and shortcuts to make your LG G Vista your own. Improve battery performance on your LG G Vista. Learn to connect to other Bluetooth® enabled devices on your LG G Vista. Learn how to pair your LG G Vista with your Bluetooth device. Call from contacts or the Favorites widget on the home screen of your LG G Vista. Learn how to change the ringtone on your LG G Vista smartphone. 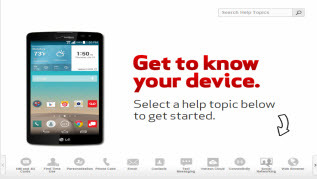 An interactive guide on how to place a call to a contact using your LG G Vista. Learn how to use your LG G Vista to call a new number. A visual guide on how to return to a call on your LG G Vista. A visual guide for setting your LG G Vista to silent. An interactive guide for setting your LG G Vista to Airplane mode. Send multimedia files from your phone to other devices with Smart Share on your LG G Vista. Learn how to record a video using your LG G Vista. Learn how to take a picture using your LG G Vista. Get started with email on your LG G Vista. Learn how to forward an email on your LG G Vista. A visual guide for replying to an email on your LG G Vista. A step-by-step visual guide for sending an email using your LG G Vista. Gestures are fun and esay ways to perform actions on your LG G Vista. Use Mobile Hotspot on your LG G Vista. Here's how to add a virtual private network (VPN) to your LG G Vista. Browse the web on your LG G Vista. An interactive guide for changing the language settings on your LG G Vista. Share content with a tap of your phone with the NFC feature on your LG G Vista. Learn how to remove a micro SIM card from your LG G Vista. Learn to set up Wi-Fi on your LG G Vista. Use Wi-Fi Direct to easily connect via Wi-Fi to other devices on your LG G Vista. Here's how to use Wi-Fi Direct so you can easily connect your G Vista with other Wi-Fi capable devices.